Roosevelt's Diner & Bar - Social Media PR Yay or Nay? #NotHorsePiss ~ Smithankyou - Lifestyle and Travel Photo Blog. Anyway, some days ago I was pointed to this post on the Instagram by a colleague saying "omg, social media crisis liao." And to no surprise I actually know the parties involved in this little "crisis". To be honest is it a crisis? 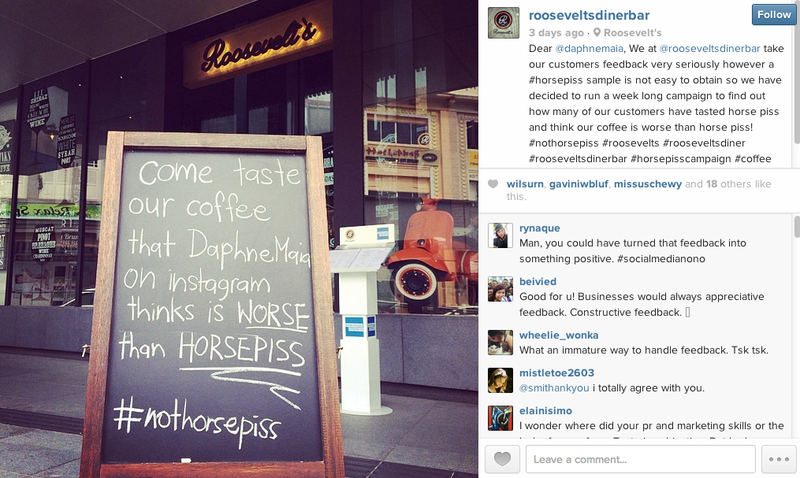 "Dear @daphnemaia, We at @rooseveltsdinerbar take our customers feedback very seriously however a#horsepiss sample is not easy to obtain so we have decided to run a week long campaign to find out how many of our customers have tasted horse piss and think our coffee is worse than horse piss!" I will never see any crisis as a crisis when it comes to customer service, especially not when it is on Social Media. Every potential threat is always a potential opportunity if you ask me. I think turning a whole customer feedback into a campaign is really pretty cool, in fact it has been done so often around the world. I actually find it really cool that Roosevelt found real influencer as well as people to speak up for the brand. I mean companies invest millions and millions of dollars to find true brand advocate, people who will speak up and defend the brand without paying a single dollar on engagement or advertorials. Lazy to download and upload a video, basically he was saying if this is horse piss, he will drink it everyday. It's GOOD! The part where they did a not so subtle jab at Daphne Maia that she drank horse piss before. "#horsepiss sample is not easy to obtain so we have decided to run a week long campaign to find out how many of our customers have tasted horse piss"
I mean "well played" and you can probably try saying that you didn't mean it that way and everyone is just being sensitive but well I guess we are treading a very thin line here. "Dear @daphnemaia, We at @rooseveltsdinerbar take our customers' feedback very seriously. Coffee like all food are subjective to each's preference thus we are doing a #NotHorsePiss campaign. Come down and take the challenge and have a cup of coffee. We promise nothing taste like Horse Piss here! (At least not anymore). 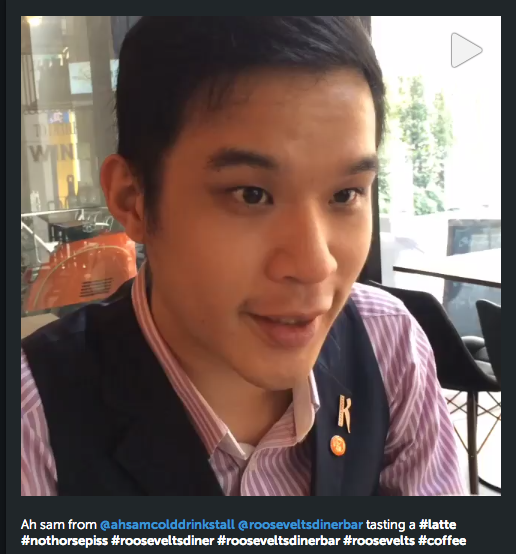 Take a selfie with our coffee and hashtag #NotHorsePiss and get X% discount off your next coffee!" I am not saying I have a better writing there or a better marketing person, I just cough that out 3mins ago but what I am saying here is you probably just do not want to sound too offensive on this since you are in the service line. After all, the text book "Customer is always right" might sound a little too much to digest in this modern society but to be honest, our mindset ain't too far away for most paying customers. They are after all the pay master and who we are trying to please at the end of the day. Don't get me wrong, I am not saying that we should always accept every ridiculous feedback and bend over just for money, but I am saying there are times we need to lose a battle in order to win the war. We just can't win every fight and we know that. To play safe, I might just contact Daphne Maia 1st and let her know that in view of her comment, we are going to do a spin off campaign and hope she is fine with that. I believe many would prefer this gesture. Not like I am giving her a chance to say "No" to it but I think it's not going to hurt anyone. Amongst all the yay and nay we have a bit of others of course, and this might be the best one and I'm gonna end the post with this. Not like this is really very good drama but comparing to media corp? mehhhhh. LOL. Like we all know, social media is a 2-edged sword so why not use both the edges to work for you? mich, nv put meme.jpg. boring. Before I make a comment let me say that @daphnemaia is also a friend and that I have never tasted the coffee at Roosevelt's Diner & Bar. I am giving my opinion as a digital marketer, PR and social media. The opinion stated is my own and not siding with any party. Daphne is entitled to an opinion of her own as the opinion was done in her space. It is after all, HER instagram and HER words. People can choose not to order other items on the menu or take what someone has called a risk with the coffee. As much as we would advocate healthy, positive conversations and communities online, the reality is that people do talk. If you look at the foursquare checkins on that location, you will find that Daphne is not the only one with a differing opinion. If Daphne is to be faulted for being crass about her instagram post, then Roosevelt is equally at fault for posting something public that looks incredibly opportunistic. On the other side of the fence, I completely agree that some of the great marketing initiatives were one that stemmed from a conflict or tension point. The marketing / PR still could have been handled better and angled with a much more positive spin. 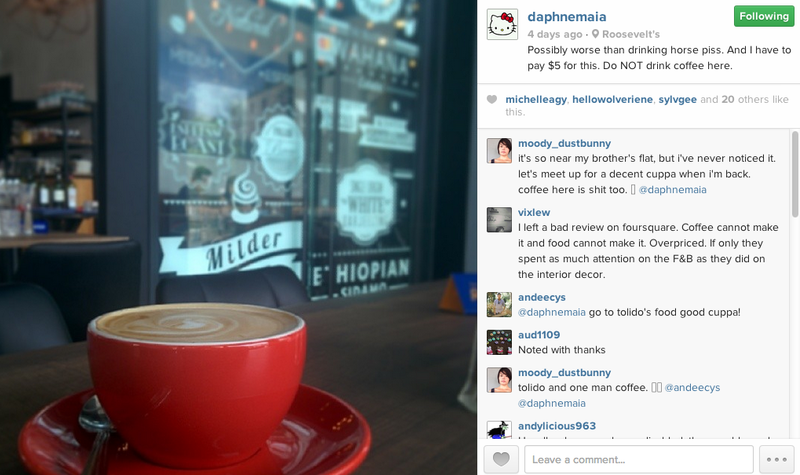 perhaps invite a number of other influencers to try the coffee or invite Daphne back to try a complimentary cuppa and give her feedback.